When introduced to photography at the age of 14, Gray says that his initial goal was to simply learn how to take good pictures. He researched all he could about the craft: how to take various types of photographs, what equipment was necessary, how to retouch using post-processing programs, etc. “There is an infinite number of things to study. Presently I am focusing on ways to best incorporate leading lines, and I am studying advanced post-process techniques.” Another personal challenge is finding methods to invent an original composition when photographing popular subjects such as the Golden Gate Bridge or a Bay Area lighthouse. That practice is paying off: Gray is selling more and more fine art prints. Landscape photography can be very rewarding as it lets you be creative and allows you to explore many different places. Fortunately both parents are avid photographers so he had access to their equipment. Noting, “I started using their AF-S DX NIKKOR 35mm f/1.8G, a AF Zoom-NIKKOR 80-200mm f /2.8D ED, AF-S NIKKOR 28-300mm f/3.5-5.6G ED VR plus other pieces of glass. My mom eventually gave me her Nikon D7000.” As his skills developed, Gray began tossing more tools into his backpack, including an intervalometer, tripod, three axis time-lapse motion control system, neutral density filters and a camera rain cover. A high school senior, Gray makes time to shoot after school, on weekends and occasionally during dawn hours. An average 10 hours a week goes to photography, and even more goes to planning and prepping. The steps before a shoot: format all memory cards, charge all batteries, clean all gear. He ensures that his backpack holds necessary equipment, and that granola bars, water and other essentials are inside. For star photography Gray favors the Sky Guide app which shows position of the Milky Way, Polaris, the moon and other celestial bodies in the solar system. Some of my best landscape shots incorporate an interesting foreground, mid-ground, and background. Including these three aspects will add a sense of scale and depth that will draw your viewers into your image and will make your photo seem more three dimensional. Some examples of interesting foregrounds include, rock formations, stones or boulders in streams, wildflowers and flowing water. Photographed using the Nikon D7000, AF Zoom-NIKKOR 80-200mm f /2.8D ED, ISO 800, f/9.0, 1/200 second. Photographed using the Nikon D7000, AF-S VR Zoom-Nikkor 70-300mm f/4.5-5.6G IF-ED lens, ISO 100, f/16, 1/250 second. A second image was created from the vantage point of Glacier Point. 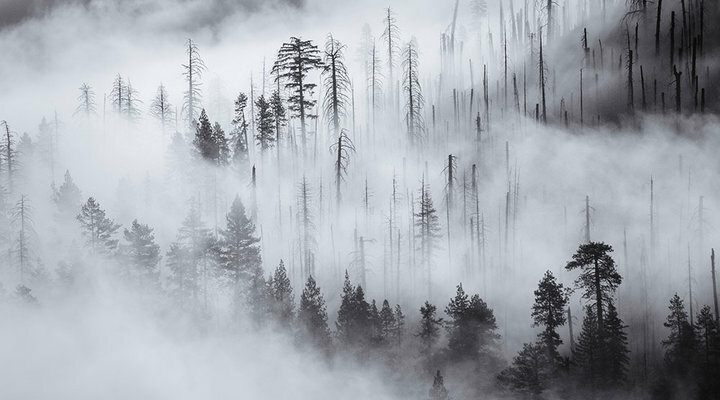 With the objective of showcasing the autumn fog blanketing regions of Yosemite National Park, the photographer and his father arranged an early drive to the overlook, located 3,200 feet above the valley floor. Gray says, “After grabbing several good shots from high up we began the return drive.” While keeping an eye on scenery, Gray became enthralled by a patch of fog as it was slowly drifting in and out of the trees—the morning sun providing an exceptional backlight. Light is key! For most landscape scenes, you will want to shoot during sunset or sunrise, when the day’s light is the softest. This may require a little lost sleep, but the results will be worth it. Having the right light can make or break your photograph. Shooting during high noon when the day’s light is harsh may make a particular scene seem flat and boring while shooting the same scene at sunset can really make it come alive. For image formatting, always shoot in RAW. Images shot in RAW capture much more information than any other type of file. Although RAW files are large and take up more space than traditional JPEGs, they allow you to have much more control over white balance, highlights, shadows, contrast, and more in post processing. Other than study and practice, Gray cites that shooting aside other photographers can be a really valuable experience. Not only does it give you a chance to increase your knowledge, but more importantly it provides a venue to express your own thoughts. “However, when working with a group it is important to preserve your own unique vision and way of shooting,” he stresses. “Rather than setting your tripod and camera aside a peer, find a unique perspective. There are tons of opportunities to invent a composition.” Photo walks are great for socializing, but he feels these gatherings are not always productive when it comes to capturing the kinds of landscape shots that he most likes to create. Social Media Pluses: Posting your work on social media sites can be both helpful and unhelpful. Two sites in particular have helped me connect with many talented photographers who share a love for landscape photography and the outdoors. From these individuals I have learned many different things—everything from shooting techniques to tips on business marketing. Social Media Minuses: There is a downside to social media as well; in some cases it can hinder an artist’s creativity. For example, if a photographer sees a certain shot that he or she likes on social media that person may try to replicate it. Every photographer should try to have his or her own unique creative vision; there shouldn’t be holes in the ground where countless photographers have set up tripods in the same spot. I have been a victim of this. Once I realized this was happening I made it a goal to come up with original content wherever I go. 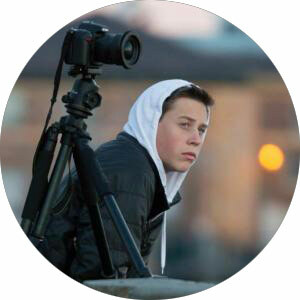 Taylor Gray discovered his talent for photography at age 14 during a two week backpacking trip in the Colorado Rockies. From there, he taught himself photography and started exploring the San Francisco area and beyond. In a few short years, Taylor has had the opportunity to travel to several states and to Europe, beautifully documenting the wide and varied landscapes in each place. After building quite a following on social media, Taylor is frequently asked to sell his prints and license his photos for websites. He is a passionate photographer with the goal of making a career out of it. You can see more of Taylor’s work on his website www.taylorgray.photo.